3.2 out of 5 based on 67 bloggers and 13 commenters. 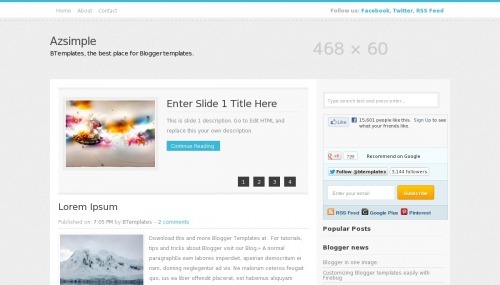 Azsimple is a free blogger template adapted from WordPress with 2 columns, right sidebar, footer columns, slider, posts thumbnails, girly looking and neutral colors. Nice theme I used this for one of my friends blog. I want to ask, what should I change if I want to add more post on the homepage? how can i edit the slider and the image ?